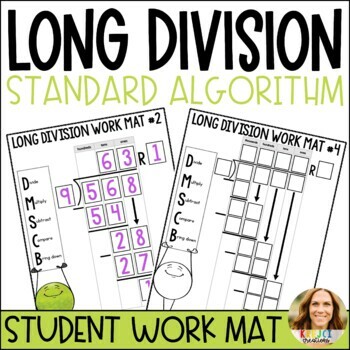 Do your students struggle with long division? 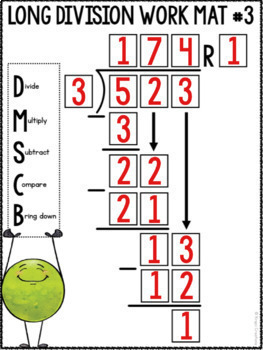 These work mats are the perfect way to guide them through the traditional algorithm and make your life easier! This product includes three different work mats along with mini versions. Below is a description of each work mat. Work mat #1 is meant for 2-digit by 1-digit problems in which the quotient is two digits. For example: 87 ÷ 5 = 17 r 2. Work mat #2 is meant for 3-digit by 1-digit problems in which the quotient is two digits. For example: 253 ÷ 8 = 31 r 5. Work mat #3 is meant for 3-digit by 1-digit problems in which the quotient is three digits. For example: 689 ÷ 4 = 172 r 1. 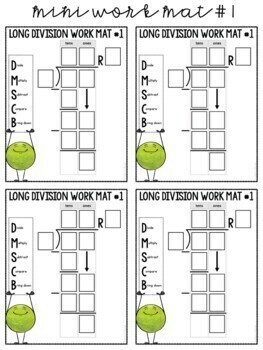 Use during whole group instruction by placing them in sheet protectors and using dry erase markers. Keep these available for students to use when necessary. Smaller versions are included in case you’d like to give each student a copy to keep or display at a small group center. Be sure to leave feedback to earn credits towards future purchases!